Report ICE and help protect your community. If ICE comes to your home, workplace, or neighborhood, report this action by calling (415) 200-1548 and send help to those impacted. Do not open your door. ICE cannot come in without a legal search warrant signed by a judge. A DHS warrant is not enough. If they do have a legal search warrant, it should be slipped under the door. Do not sign anything. Do not sign any forms without an attorney present. 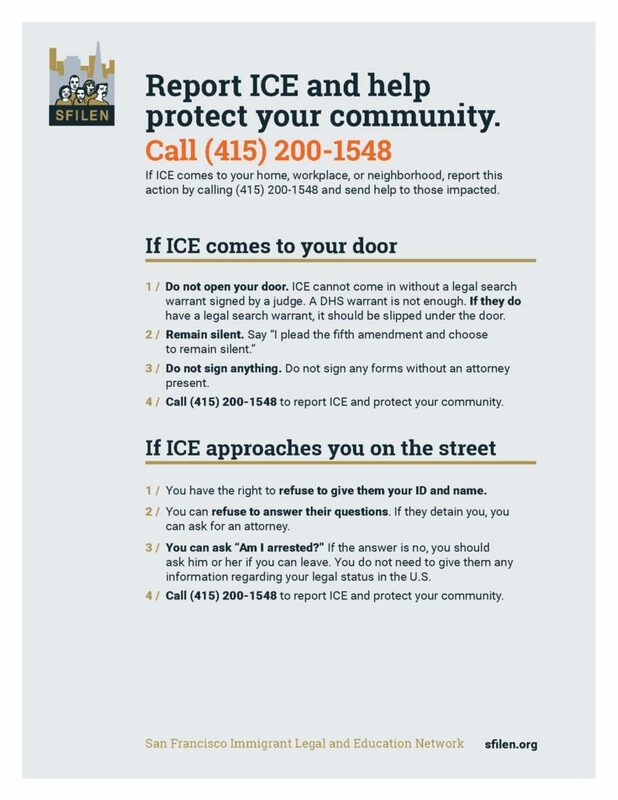 Call (415) 200-1548 to report ICE and protect your community. You have the right to refuse to give them your ID and name. You can refuse to answer their questions. If they detain you, you can ask for an attorney. You can ask “Am I arrested?” If the answer is no, you should ask him or her if you can leave. You do not need to give them any information regarding your legal status in the U.S.